As typewriters gradually go extinct, their value as antiques rises. Unfortunately, this usually means that old manual typewriters are dusty, rusty and covered in gunk. 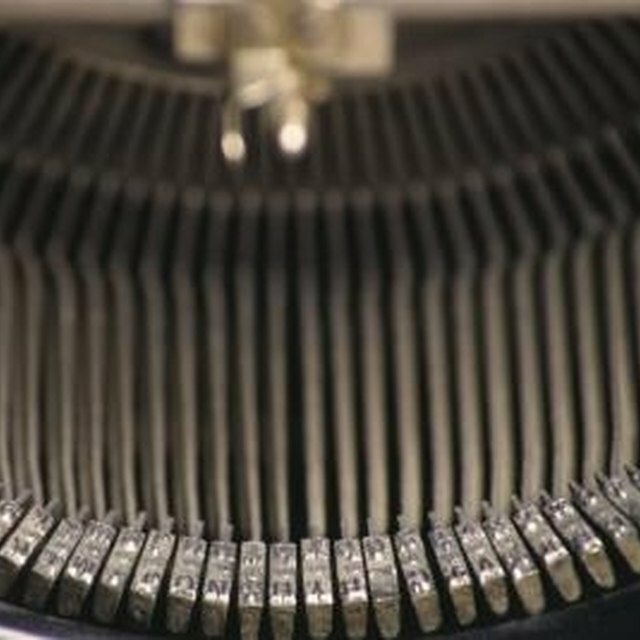 If past owners over-oiled the typewriter and let it sit unused for long periods of time, oily dust has probably turned into stubborn, sticky grime -- and typewriter keys are sometimes the worst hit. They are crucial to the machine's overall appearance and functionality. Fortunately, you can clean those critical parts to make your typewriter keys click and sparkle again. Start with gentle methods of cleaning and save tougher methods for stubborn grime. Dip a rag into a bowl of water mixed with a few drops of dish detergent. Wring it partially dry and gently wipe the typewriter keys with it. This will eliminate the surface layer of dust and dirt. Rub aluminum polish on the keys to remove rust. For stubborn spots, gently scrub with superfine sandpaper or superfine steel wool, as typewriter collector Dr. Richard Polt, Ph.D., of Xavier University recommends. Gently scrub the tops and sides of the keys with a toothbrush. Dip it into the water and dish detergent for extra cleaning power. Alternatively, rub with a damp cotton swab. This helps to get rid of stubborn traces of dirt that require some elbow grease. Scrub the type bars with a toothbrush to remove dirt that may cause the keys to stick when you type. Avoid using water or soap here, as it may encourage rusting if the type bars do not properly dry. Gently slide a nail file or knife between the segment slots of the type bars to eliminate dirt, as a 1977 Reader's Digest book on typewriter cleaning suggests. Brush away the loosened dirt with a soft brush, such as a paintbrush. This helps ensure smooth clicking when you type and improves the overall appearance of the machine. Press down on as many typewriter keys as you can with one hand and brush beneath the type bars with the other, using the soft brush. Drip a few drops of sewing machine oil -- not any other kind -- between the type bars to ensure that the keys will move easily. Don't overdo it, as this may create a sticky mess over time. A light application of sewing machine oil, however, encourages stick-free typing and keeps the typewriter looking polished. Start with gentle cleaning methods, then work your way to tougher methods if rust and grime prove stubborn. This reduces your odds of damaging the typewriter with immediate rough cleanings.